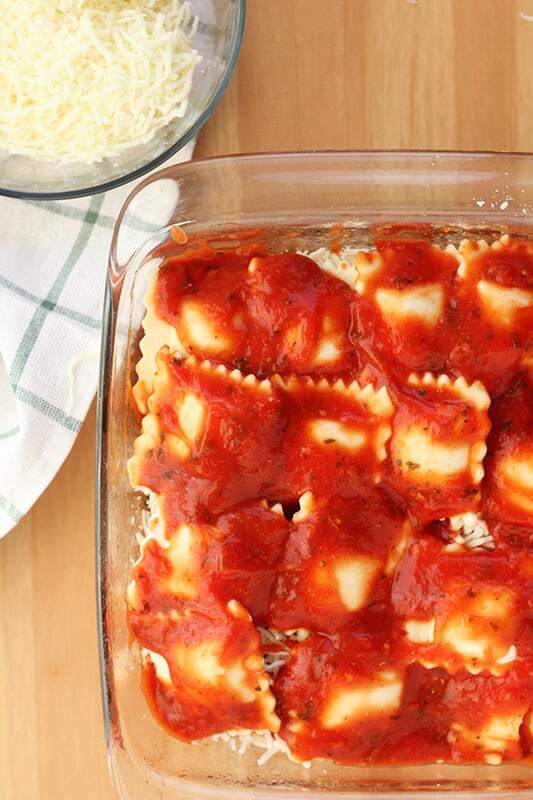 This Ravioli Bake Recipe has just 5 ingredients making it a weeknight dinner staple! Easy, delicious, and filling. A winning combination when it comes to a great dinner recipe. Takes less than 10 minutes to put together. This bake has it all. It tastes great, only uses 5 ingredients, and takes a total of 10 minutes to put together! Did I mention it is also a kid approved recipe? My 9 year old said it tastes exactly like my lasagna. Which also happens to be one of his all-time favorites. I always love to get his approval. Especially on easy weeknight dinner ideas. What ingredients are in a pasta bake? Cook your sausage or hamburger. 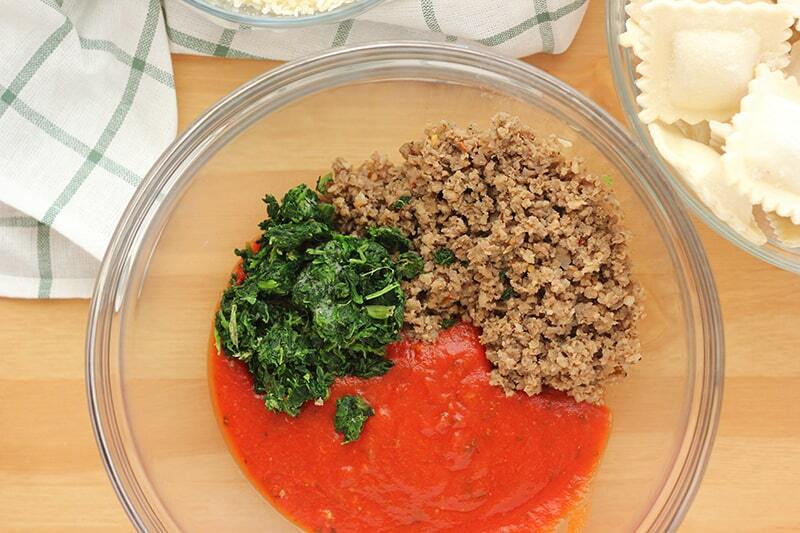 Mix with a little of your pasta sauce and spinach. Set it aside. Spread a small amount of pasta sauce into a pan. 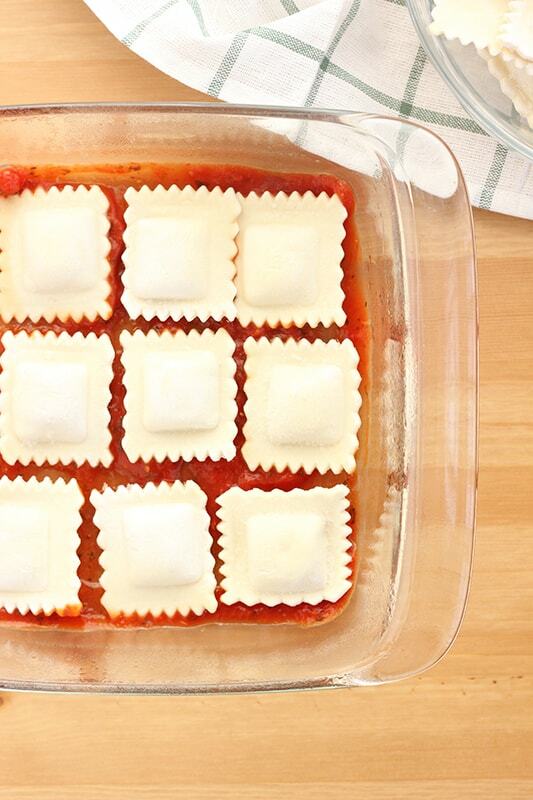 Layer ravioli in a single layer. It’s ok if they overlap a bit. 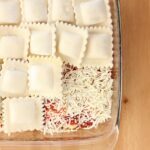 Spread your sausage mixture right on top of the ravioli. 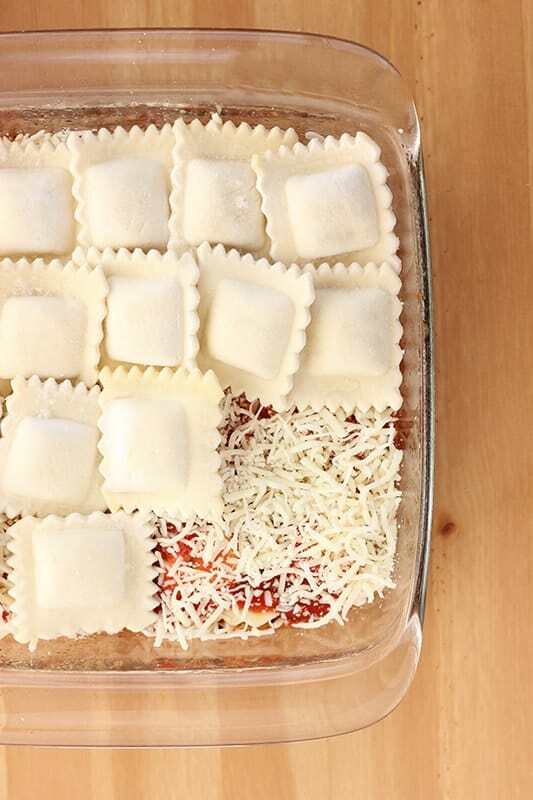 Add another layer of ravioli. TIP: We often cook a large batch of ground beef ahead of time and freeze it in individual servings. This saves even more time when you are assembling your meals! 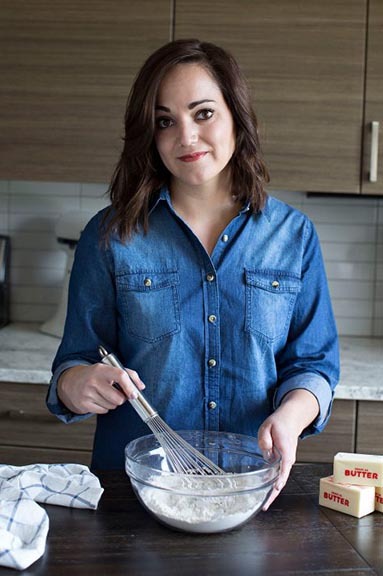 You cannot mess this recipe up. It is so simple and a family approved meal! Can you substitute hamburger for sausage in a pasta bake recipe? Of course! We have made this with ground beef, ground sausage, sausage links, and ground turkey. All seem to be just as delicious as the next. Consider making this ahead of time. On occasion, I have put this together the night before or the morning of. I store the pre assembled dish in the refrigerator and pull it out about 10 minutes before putting it into the oven. Cook it as directed and enjoy! Stir together 1 cup of the pasta sauce with the sausage and spinach. Set aside. Mist a 9 inch pan with cooking spray. Spread about 1/2 cup of pasta sauce on the bottom of the pan. 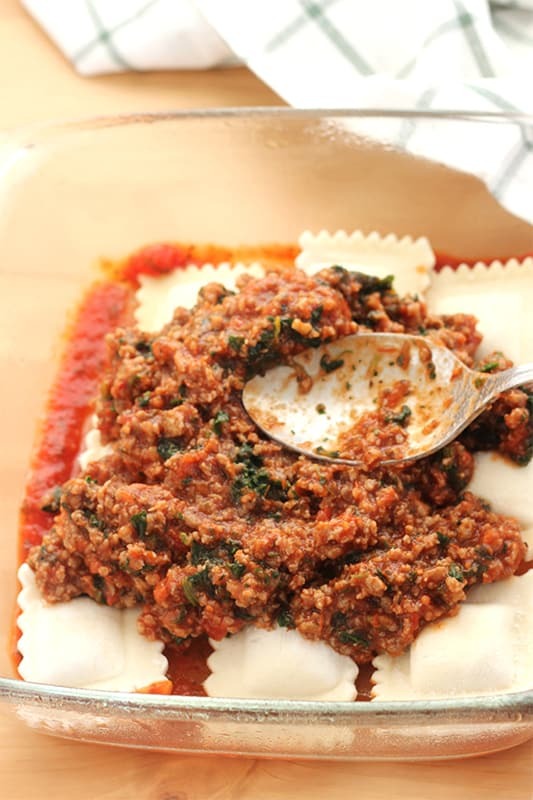 Place ravioli in a single layer on top of the sauce. This should use about 1/3 of the package. Spread all of the meat mixture on top of the ravioli. Top with another layer of ravioli. Spread with 1/2 cup of sauce and sprinkle with 1 cup of cheese. Repeat this layer. 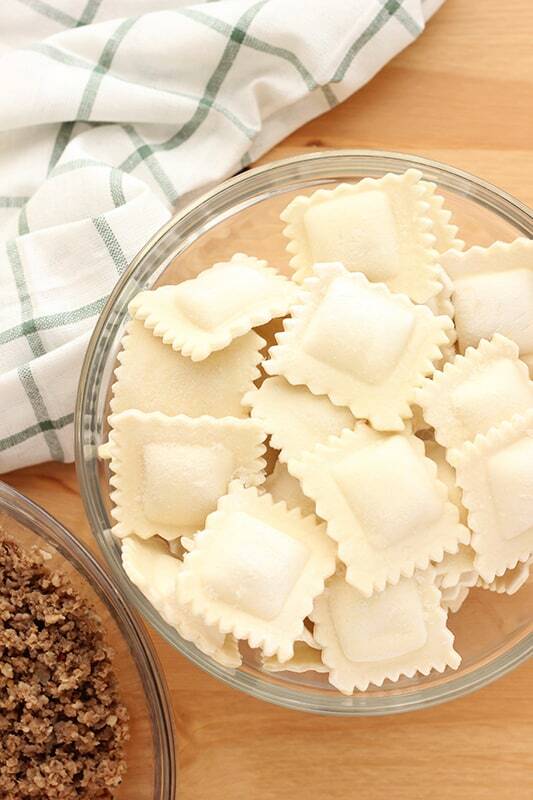 Cover your pasta with foil and bake 40 minutes. Remove the foil and continue to back an additional 20 minutes or until the cheese is melted and the sauce is bubbly. Made this and loved it. It was so easy and perfect for a busy weeknight. My pasta loving family gobbled it up. We might try it again with tortellini and some added vegetables. Glad you enjoyed this recipe as much as we did, Terry!